The first trimester covers your pregnancy right from the time of conception when the first cells are formed, up until the end of week 12. It’s an important trimester in terms of your baby’s development – organs take shape, your baby starts moving and muscles form. Your 12 week old baby emerges from this trimester as a fully-formed foetus, about the size of a peach, ready to enter the second trimester. Eat 5 portions of fruit and vegetables every day, to provide you with good amounts of vitamins (e.g. vitamins A and C and folic acid), minerals and fibre. Include low fat dairy products. Include lean meats, fish and other protein-rich foods like eggs, pulses and beans. These foods provide protein, iron and folic acid. Eat oily fish at least once a week (but not more than twice a week) to get your essential omega-3 fatty acids. Avoid foods and drinks high in sugar, fat and salt, e.g. sweets, sugary drinks and processed foods. You don’t need extra energy (calories) until the third trimester. You will likely only gain a very small amount of weight or none at all in the first trimester. Most of your pregnancy weight will be put on in the second trimester, so there’s plenty of time for weight gain! Your body has a small increased requirement for protein (found in foods like meat, fish, nuts, beans, pulses and cheese). However dietary surveys show that most of us eat more than our requirements anyway – average intake for women aged 19-49 is 61g per day (pregnancy requirement is 57g). There are increased requirements for folic acid and vitamin D, and supplements for these vitamins are required. Vitamin A requirements are slightly raised, but be sure to avoid supplements containing vitamin A and liver/liver products as they contain a potentially toxic form of vitamin A. Safe forms of vitamin A are found in fruits, vegetables and dairy products. We need to take folic acid (400 micrograms per day) and vitamin D (10 micrograms per day) during the first trimester. 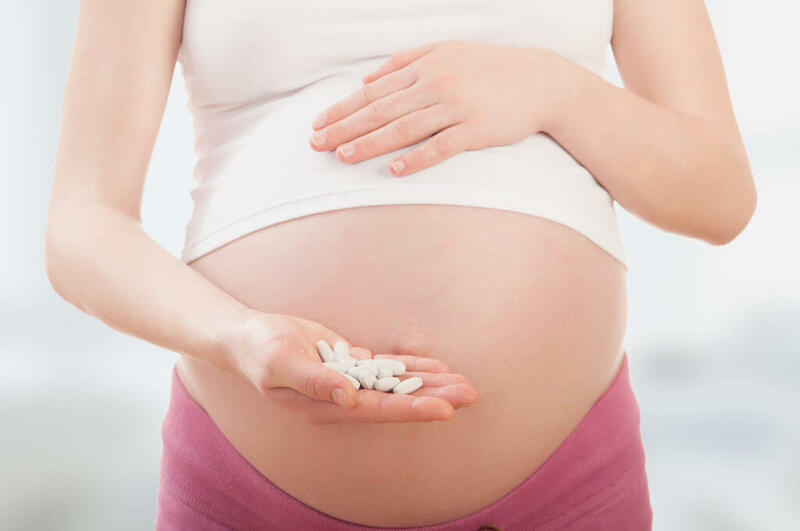 Taking folic acid supplements during pre-conception and for the first 12 weeks has been shown to help prevent neural tube defects, e.g. spina bifida. If you didn’t take folic acid pre-conception, try not to worry – just start taking it as soon as you find our you’re expecting. Vitamin D is important for bone health, and helps us absorb calcium from our diet. Most women get the majority of their vitamin D needs from the action of sunlight on skin, but requirements are higher during pregnancy, so supplements are required. You can either take single vitamin supplements of folic acid and vitamin D (check the label to ensure you’re getting the right dose), or you can take pregnancy multi-vitamin supplements or Healthy Start Vitamins. Don’t take regular vitamins or cod liver oil because they contain high doses of vitamin A which could be harmful for your baby. If you already consume a healthy, well-balanced diet, all you need is the basic formula that contains the recommended 400mcg of folic acid and 10mcg of vitamin D. You can get it from Boots or Holland & Barrett. Also, it’s a great option if you’re on a budget! For those of you who feel like you could use some additional help in the nutrition department, go for a more complete supplement such as UK’s bestselling prenatal formula Pregnacare Plus Omega-3. It contains a combination of 19 vitamins and minerals, including 400mcg of folic acid and 10mcg of vitamin D, plus fish oil capsules. Another option is New Chapter Perfect Prenatal. It’s an organic, whole food supplement rich in high quality nutrients, including multivitamin complex and probiotic blend. Although quite expensive, the supplement is very highly rated on the other side of the Atlantic and you can buy it in the UK from Amazon or small online vitamin retailers. Liver and liver products – avoid these as they contain high levels of vitamin A that could be toxic for the developing baby. Paté – avoid meat, fish and vegetarian patés, as they could contain listeria. Raw / undercooked meats and fish – avoid these as they could contain dangerous bacteria, e.g. 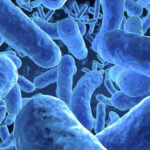 listeria and E.coli. Raw / undercooked eggs – avoid dippy eggs and cook eggs until the yolk is solid. Beware of home-cooked products using raw eggs, e.g. mousses, home-made mayonnaise and ice-cream. Certain fish – avoid shark, swordfish and marlin due to potentially high mercury levels. Limit oily fish (e.g. salmon, mackerel, pilchards, tuna steak) to a maximum of twice a week. Certain dairy products – avoid unpasteurised soft cheeses, and blue vein / mould-ripened cheeses, as they carry a risk of listeria. Avoid any other unpasteurised milks and dairy products. Caffeine – to reduce risk of miscarriage and maximise iron absorption, limit to 200mg a day. 200mg of caffeine is the amount in 2 mugs of coffee, 2 ½ mugs of tea or 5 cans of cola. Alcohol – it’s best to avoid alcohol, but if you choose to drink alcohol, the officially guidance is to limit it to 1-2 units once or twice a week. Sip on fluids through the day and when you feel sick. Cold drinks, e.g. fruit juices, fizzy drinks and squash may be better tolerated. Try eating smaller portions at mealtimes, with frequent snacks in between. Starchy foods are often better tolerated, e.g. sandwiches, toast, crackers or breadsticks. Avoid overly spicy and fatty foods – blander foods may be better. Foods and drinks containing ginger may help, e.g. ginger biscuits or ginger beer. A small study showed some success in in women taking root ginger or ginger capsules (250mg four times a day) for four days. You could also try peppermint or chamomile tea. It’s safe to continue your usual exercise during pregnancy. If you’re not active, now is the time to start something regular. Build up gradually, aiming for 30 mins at least 5 days a week. Regular physical activity will not only keep your weight in check, but may help you have an easier pregnancy and labour. Unwashed fruits, veggies and salads could contain toxoplasmosis, a parasite which could potentially cause miscarriage and birth defects. 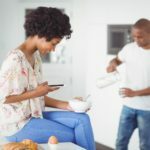 There are many theories for why women get cravings, but there is no firm evidence as to why they occur. If your cravings involve unhealthy foods, try not to worry as cravings are usually only temporary. You may experience this, although it can be worse during the second and third trimesters. Eating small, frequent meals, sitting up at the table and not eating too close to bedtime may help ease heartburn. Chief Medical Officers in the UK (2011) Vitamin D – advice on supplements for at risk groups (Accessed September 2013). Great Britain Committee on Medical Aspects of Food and Nutrition Policy Working Group on the Nutritional Status of the Population Great Britain Department of Health (2000) Folic acid and the prevention of disease. Report of the Committee on Medical Aspects of Food and Nutrition Policy. London: The Stationery Office. Henderson et al (2003) The National Diet and Nutrition Survey: adults aged 19-64 years. Volume 2. London: The Stationary Office. NHS Choices (2013) Nausea and morning sickness (Accessed September 2013). Ruxton CHS (2011) The benefits of fish consumption. Nutr Bull. 36(1):6-19. Specker B (2004) Vitamin D requirements during pregnancy. Am J Clin Nutr. 80(6):1740S–1747S. Vutyavanich T, Kraisarin T and Ruangsri R (2001) Ginger for nausea and vomiting in pregnancy: randomized, double-masked, placebo-controlled trial. Obstet Gynecol. 97(4):577-582. 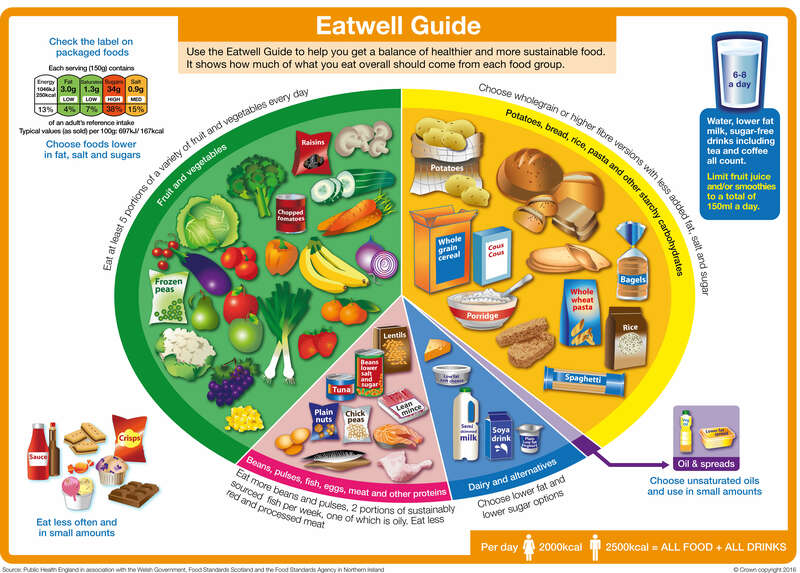 Webster-Gandy J, Madden A and Holdsworth M (2011) Oxford Handbook of Nutrition and Dietetics, 2nd Edition. Oxford University Press. 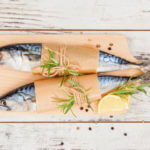 What’s so fishy about eating fish during pregnancy? The information provided on this site is not meant to substitute for the advice of a qualified medical professional. 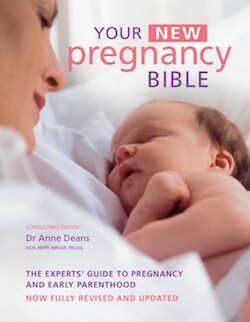 Dietinpregnancy.co.uk neither assumes any legal liability nor makes any warranty or guarantee, either expressed or implied, regarding the completeness, accuracy, usefulness, or currency of this information. It is the responsibility of the reader to check for updates to the information contained on this site.